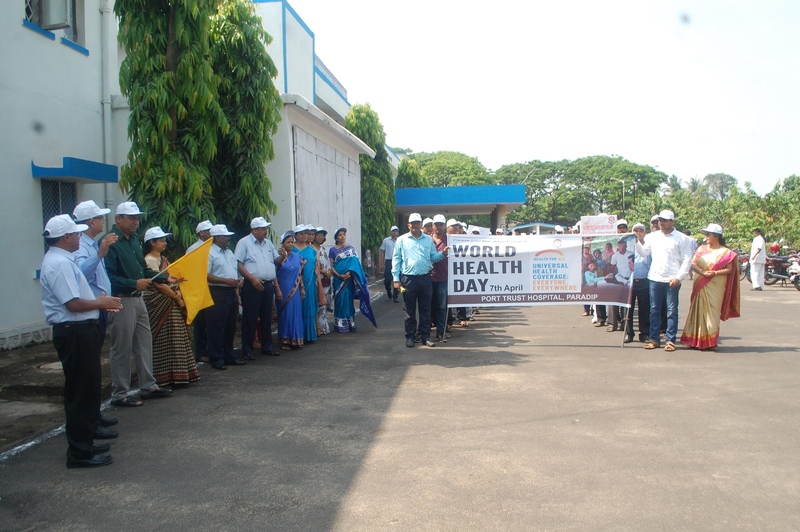 “Cultivate and Sustain a Safety Culture for Building Nation” as the theme, the 48th National Safety Week was observed by Paradip Port Trust. 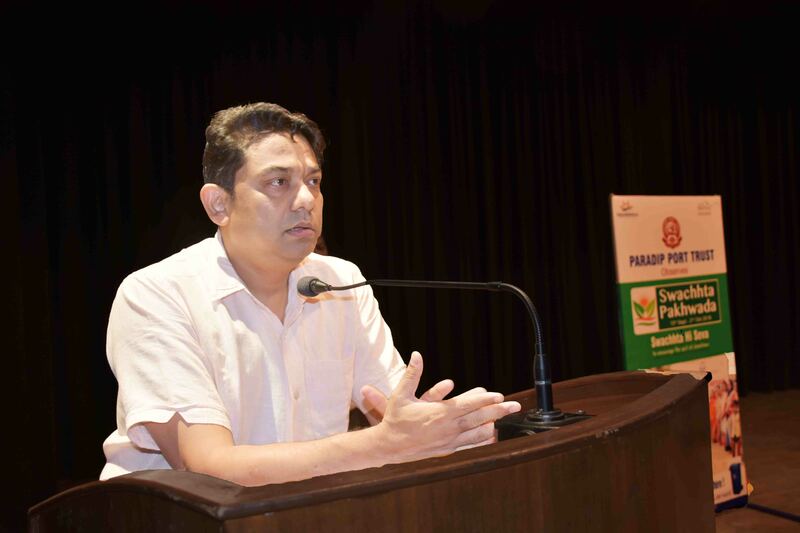 Shri Rinkesh Roy, Chairman, PPT inaugurated Safety Week Celebrations on 5th March 2019. Saftey Rath and Safety Rally have been the major highlights of the week long celebrations. The valedictory function was held in the afternoon on 8th March 2019 near Gate No 4. Attending the function, as the Chief Guest Shri K. Ramchandra Rao, Chief Engineer, PPT focused upon importance of celebrating Safety Week. He stressed on various safety measures undertaken by PPT to control environmental pollution like Dry Fog Dust Suppression System at MCHP, Net Barrier, Road Sweeper, Mist Cannon Spray etc. Addressing the gathering, Shri S.K. Mishra, Traffic Manager, PPT suggested for ensuring the upcoming year as Zero Accident Year for PPT. He elaborated how Traffic Squad movements are being made tight to keep close vigil on rash driving. Capt. A.C. Sahu, Harbour Master, PPT highlighted about various improvements in the safety measures of PPT for the last 3 years. Dr. P. Panda, Chief Medical Officer also spoke on the occasion. Thereafter, the winners of various competitions organised on the occasion were awarded. Shri Saroj Kumar Das, CME, PPT in his welcome address called upon all the stakeholders to make Safety a way of Life. Shri R.N. Panigrahi, Safety Officer, PPT offered the vote of thanks. In order to cater to needs of the denizens from the peripheral areas of Paradip Port, free cataract operations have been conducted on 225 poor persons at PPT Hospital in a year under CSR scheme. In a meeting held in the Conference Hall of the Hospital, today on 07.03.2019, cheques towards spectacle assistance have been distributed for post-operation care. While distributing the cheques, Shri Rinkesh Roy, Chairman, Paradip Port Trust congratulated the Dr. P. Panda, Chief Medical Officer, Dr. D.P. Sethy, and Ophthalmologist who carried out the successful operations along with the Medical Staff in association with the Paradip Sakshyrata Samity. Smt. Subhalaxmi Roy, President, Paradip Ladies Club & other HODs of PPT were also present on the occasion. The Chief Medical Officer informed that Dr. Sethy & his team along with the volunteers of Paradip Sakshyarata Samiti have taken active part in making such operations quite successful. He informed that PPT has spent Rs. 9,000/- per head for this surgery, whereas such surgery costs about Rs. 25,000/- in private Hospitals. Further, the Port Authorities have set a target of 250 free cataract operations of the unprivileged people from the periphery to be conducted in the next fiscal. It is to be noted that, PPT Hospital is currently equipped with state of the art ophthalmic and other equipments. Paradip Port once again repeated the feat of handling 100 Million Metric Tonnes (MMT) of cargo for 2nd fiscal year in succession on 05.03.2019. With 26 more days to go, the Port is likely to handle 110 MMT targeted cargo set by the Ministry of Shipping for the FY-2018-19. The achievement of 100 MMT cargo handling in consecutive two years shows the commitment of the Port towards its customers and the country as a whole. In the process of handling 100.04 MMT cargo as on 05.03.2019, the Port has achieved a growth rate of 5.86% over the corresponding period of 2017-18 when the Port had handled about 94.5 MMT. In terms of absolute growth in tonnage, the increase of 5.57 MMT of cargo over the last fiscal at PPT is the highest amongst all Major Ports achieved so far. The major growth drivers of the cargo at PPT in the current financial year are the handling of POL and Coastal Thermal Coal which are showing a growth rate of 9.86% and 20.49% respectively over the corresponding period of FY 2017-18. The above achievement of 100 MMT of cargo again by PPT in the current fiscal is despite 2 of its existing berths are not available for handling of cargo and are under mechanization process. For the above feat, Shri Rinkesh Roy, Chairman, PPT congratulates the user industries to have their continued faith on the ability of the Port to serve them with challenges emerging from the neighboring Non-Major Ports. Congratulating the employees and officers of the Port for their continued commitment to serve the trade, Chairman, PPT takes the pleasure of appreciating the support of Govt. authorities like Ministry of Shipping (GoI), Govt. of Odisha, Indian Railways, Customs, Immigration Department, Dock Safety, MMD as well as all Service Providers/Terminal Operators for their sustained effort in achieving the above feat. Officers, Employees and Workers of Paradip Port Trust paid condolence to the Martyrs of CRPF in Kashmir by observing silence and prayers for two minutes in front of Administrative Building at 11 A.M on 16.02.2019. Republic Day was celebrated by Paradip Port Trust Authority with a great passion. Shri Rinkesh Roy, Chairman, PPT unfurled the National Flag and took salute from 40 platoons consisting of CISF Jawans, students of Paradip College, different schools of Paradip Township and employees of PPT retiring this year. Announcing the docking of a luxury cruise liner MV Silver Discoverer with foreign tourists in the morning, Shri Roy described it to be proud moment, which will boost and inspire tourism in the State. Addressing on the occasion, Chairman, PPT informed that the Port is expected to reach 110 MMT mark in terms of cargo handling this fiscal, exhibiting a growth rate of 11.56% (CAGR). The Port capacity has been rated at 277 MMTPA making it the largest in the country, while effective capacity has been increased to 234 MMTPA. Operationally, it has scaled new heights in terms of innovations & efficiency. The Mechanised Coal Handling Plant has shown an improvement in efficiency by 65%. It has loaded 1.32 lakh MT in single day in comparison to 1.01 lakh MT in FY 2014-15. The Iron ore handling plant has shown 141% improvement in efficiency with net loading rate stands at 1000 TPH, which was just 414 TPH in FY 2014-15. Marine Deptt. handled a record 27 nos. of vessel movements in just 20 Hrs. For the first time, the Port has discharged edible oil from “MT Delfine” through Mediterrnean Mooring Method without using any berth. All time record traffic of 6.39 Lakh MTs was handled in a single day on 14h October 2018. All time monthly traffic of 10.18 MMT was handled during the month of January, 2018. As part of green initiatives to curb pollution, Dust Suppression System has been implemented at MCHP. 2 Mist Cannon machines and 1 Mechanical Road sweeping machines are cleaning the roads. Plantation of 8 lakh trees in and around the Port city has been done. Outlining a paradigm shift in the safety culture & practices by the Port, he told that the focus for this year is to impart proper training of workers, introduction of bus services and prohibition of two wheelers and persons walking inside the Port, introduction of no standing zones in berth areas and level crossing warning systems. The Port has taken great measures to improve the welfare of employees and its stakeholders like introduction of insurance scheme for employees and workers, planning for construction of new houses and state of art Desalination Plant, changing of water pipelines, construction of Sewerage Treatment Plants. For the benefit of local fishing community, the Port has undertaken the lighting of Fishery Harbour Road and dredging of the navigational channel from Mahanadi River Mouth. Thereafter, Shri Roy awarded prizes to the winners of different competitions held for the occasion. He also felicitated the officers and employees of the Administrative, Traffic, Marine, Medical, Engineering Departments and IOHP division, for their exemplary works. A Poet’s Meet was also organised at Officer’s Club followed by an exhibition Women’s Volley Ball match in the afternoon at Gopabandhu Stadium. In the evening, Inter School Dance competitions on Patriotic theme were held among school children at Jaydev Sadan. Nearly 62 foreign tourists on board MV Silver Discoverer from the countries like Australia, UK and South Africa were given a grand welcome at the Wet Basin of Paradip Port Trust this morning by Capt. A.K. Mohapatra, Dy. Conservator, Capt. A.C. Sahoo, Harbour Master and other top officials of PPT. The visitors then went on tour to Buddhist Sites at Ratnagiri and Udayagiri. They are fascinated by the heritage, art and culture of Odisha. This morning to dusk ultra luxury cruise liner is a 1989 seven-star liner, built in Russia. It has LOA of 102.965 Mtr and Beam 15.40 Mtr Beam with Bahamas Flag. The ship came from Vizag and will proceed to Bangladesh in its next Port of Call. Paradip Port has ample infrastructure to cater to the cruise liners to call at the Port and is ready to facilitate the influx of inbound tourists to the State in future. The 16th Paradip Marathon 2019 was conducted by the Gopabandhu Kreeda Sansad of Paradip Port Trust on 3rd January 2019 on the occasion of Port Foundation Day. Shri Rinkesh Roy, IRTS, Chairman, Paradip Port Trust flagged off the same at the Hanuman Temple square. 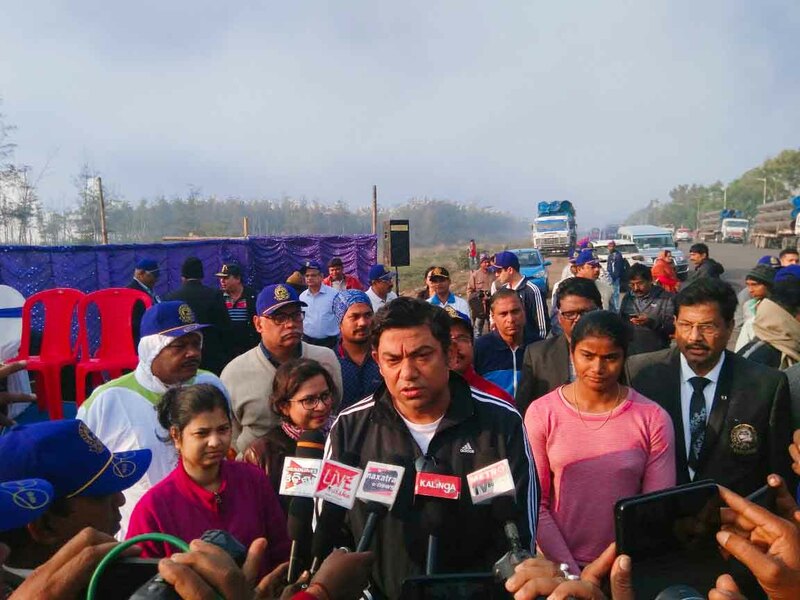 The Marathon covered a route of 14Kms and concluded at Gopabandhu Stadium amid great encouragement by the inhabitants of Port Township and members of other organizations. A total no. of 670 participants comprising of 600 male & 70 female competitors participated in the Marathon. Shri Kailash Kumbhar of Odisha Police won the first prize in the men category by completing the distance in 43 minutes 42.1 seconds, Capt. Purty of Jharkhand got the second prize (43 minutes 55.8 seconds) and Shri Mukund Banra of Jharkhand got the third prize (44 minutes 8.6 seconds) in the men category. In the women category, Ms. Samsad Ara Begum of SAI, Cuttack won the first prize (48 minutes 39.4 seconds), Ms. Milli Majhi of SAI, Cuttack got the second prize (59 minutes 22.7 seconds) and Ms. Asmita Sethy of Jagatsinghpur got the third prize (59 minutes 49.4 seconds). Attending as Chief Guest Shri Rinkesh Roy, Chairman, PPT, Smt. Subhalaxmi Roy, President Paradip Ladies Club attending as Guest of Honour and Heads of the Deptt. of PPT gave away the cash prizes at the valedictory function held at Gopabandhu Stadium. Coach of Indian Jr. National Chess Team Ms. Aparajita Gochhayat and renowned International Athlete Ms. Purnima Hembram were also felicitated on the occasion. The Officials and Technical members of the Paradip Port Sports Council with the Assistance of the officials of Odisha Olympic Associations the Marathon was conducted smoothly. Chairman, Paradip Port Trust Shri Rinkesh Roy while addressing the press during the PPT Foundation Day Programme on 03.01.2019 announced the commencement of dredging operations at Mahanadi River Mouth. This work will be carried out at an estimated cost of Rs. 15 Crores through a dredging firm, M/s Reach Dredging Limited, Kolkata. It may be noted that a major Fishery Harbour is operational at Paradip located in the right bank of Mahanadi River about 1km upstream of the river mouth. The fishery harbour is presently managed by the Odisha State Government Fisheries Department. The local fishing community has been facing difficulties as the river mouth has been silted up over the years and the fishing vessels face hindrance to navigate during approach/exit from the fishery harbour. The Mahanadi River Mouth was last dredged almost 20 years back. Chairman, PPT during his interaction with the Press informed that there is a narrow window period between January and February to complete the work smoothly in tranquil conditions and PPT has set a target of February 2019 for the Contractor to finish the work. The Ministry of Shipping has approved implementations of the above dredging work through the internal resources of the Port. It is hoped that the long lasting woes of local fishing community over a period of almost two decades will finally see the light of the day due to PPT initiative. The Paradip Marathon 2019 will be held on 3rd January 2019 at 8AM to mark the occasion of celebrations of Foundation Day of Paradip Port. The Marathon will start from the Hanuman Temple near Gate No. 5 covering a route of 14 Kms will conclude at Gopabandhu Stadium. The route will be identified and route chart will be provided to all the participants. The participants must be above 18 years and below 40 years of age as on 31.12.2018 and have to submit fitness certificate from a Govt. Medical Officer or Medical Officer of Paradip Port Hospital. A panel of Doctors from Port Trust will also be made available to check the fitness of participants, in case of necessity. All men participants have to deposit an entry fee of Fifty Rupees per head and women participants to deposit Thirty Rupees. The participants will be supplied with a set of Vest and Short and chest numbers. All outstation participants will be provided with unfurnished accommodation and dinner on 02.01.2019. On the Marathon day, breakfast will be provided to all participants after the Marathon at Gopabandhu Stadium. Registration will continue up-till Registration of 600 Boys and 100 Girls or till 4.P.M whichever is earlier. No entry will be made in the registration as well as attendance after the schedule time. Attendance of the participants shall be taken at Hanuman Temple near Gate No. 5 on 03.01.2019 from 06.30 AM to 07.30 AM. The time limit for completing the total distance of Marathon (14 KM) will be 2(Two) hours from the starting time. The winners will be awarded by cash prizes as follows. One 1st Prize of Rs.14,000/- each for Men & Women, One 2nd Prize of Rs.10,500/-each for Men & Women, One 3rd Prize of Rs.7000/- each for Men & Women, Three 4th Prizes of Rs.3,000/- each for Men & Women, Six 5th Prizes of Rs.1,500/- each for Men & Women & Nine 6th Prizes of Rs.1000/- each for Men & Women. The first 150 participants in men category and first 50 participants in women category covering the distance of 14 KM will be given mementos after which participants who complete the distance within 2 hrs. will be provided only certificate of participation. All the District Associations and Registered Clubs should encourage more and more athletes to participate in the event particularly Women athletes and nominate participants in large numbers to take part In Paradip Marathon 2019. (10.00 AM to 07.00 PM) 06722 -222076. Mob-9437183515, 9437317133. Establishment of a 400 Bedded Super-Speciality Hospital is on the anvil at Paradip Port, which will have an option to develop as Medical College in future. The tendering process has already started and the bids are to be opened in December 2018. The scope of the Super speciality Hospital is to rehabilitate, operate, manage and transfer the PPT Hospital for a concession period of 30 years and extendable by another 30 years as per concession agreement. Paradip Port Trust with the aim to create an advance Healthcare infrastructure in the locality, decision has been taken to upgrade the existing 64 bedded Hospital to a 400 bedded Super Speciality Hospital through PPP Mode. The Super-Speciality Hospital will be developed in phase manner. The estimated Project cost is kept at Rs.200 Crores and will be built on an area of 8.45 acres of land. Hon’ble Minister of Shipping during his visit to Paradip Port in July 2015 had announced to make a Super-Speciality Hospital in Paradip. Since then Paradip Port Trust has pursued the matter and tried to make it into reality. For this project a Consultant was engaged for preparation of the feasibility report and after receiving the same expression of interest had been published. With the completion of this Super-Speciality Healthcare project at Paradip Port, not only the Port employees, but the people residing in the nearby area will be greatly benefited. His Excellency, Governor of Odisha Prof. Ganeshi Lal visited Paradip Port on 08.12.2018. On arrival, Shri Rinkesh Roy, Chairman, PPT along with other senior officers of PPT received His Excellency. CISF Unit, PPT gave him Guard of Honour at the Wet Basin of Paradip Port. Thereafter, he visited the Harbour and Shri Rinkesh Roy, Chairman, PPT explained him about the functioning of the Port and briefed him about ongoing and future expansion plans being taken up for development of the Port as per the programme of the Ministry of Shipping. His Excellency the Governor expressed his happiness on the excellent growth of the Port and for retaining the second position throughput the current financial year in terms of increase in quantity of Cargo handled. In the afternoon, he was given a warm send off at Officers’ Club of PPT. On 07-12-2018 at 1130 hrs, Heavy Hydrocarbon leakage and later Major Fire scenario were created at North Oil Jetty of Paradip Port Trust. The spillage of oil at the sea water was diffused by “KALI” ship meant for controlling the same. The fire occurred at the Jetty areas was controlled by using Foam through different method and systems. The Water Curtain, Jumbo Jet, Tower Monitors, Ground monitors, numerous Fire Tenders from Mutual Aid Members were pressed into service for extinguishing the Fire. A team 25 personnel from NDRF, Mundali also actively participated in the Mega event and extend First Aid to the victims. The Fire fighting Tugs of PPT also take part to contain the fire occurred in the Ship. Three personnel injured at various locations were also rescued and sent to PPT Hospital. Harbour Master of PPT was the Site Incident Controller under the direct supervision of Dy. Conservator. The Deputy Commandant/CISF performed the role of Fire Coordinator and Safety Officer PPT played the role of Safety Coordinator in the Mega Mock Drill. All the HODs & Dy. HODs of PPT, Commandant, Asst. 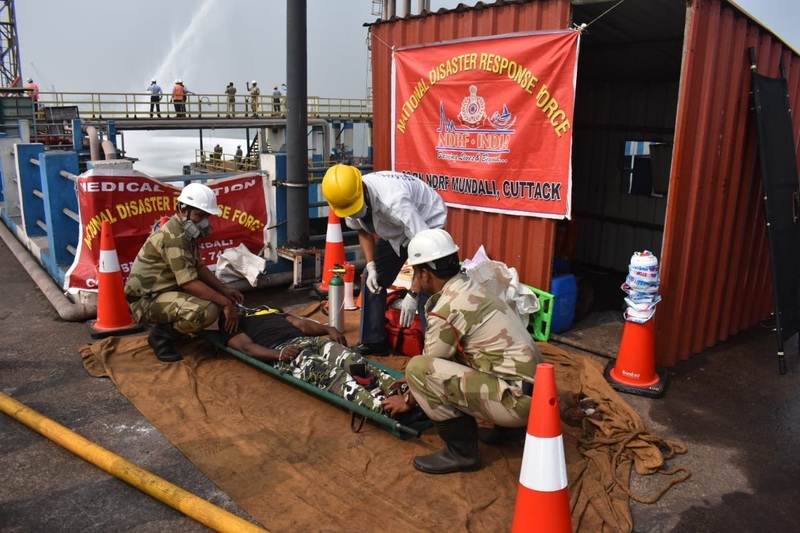 Director (Dock Safety), Safety Officers from IOCL Refinery, IOCL Pipe Line, IOCL/BPCL/HPCL Marketing Terminal, ESSAR, PPL, IFFCO, PICT, IOTL, JSW, L&T, CREW, etc participated and observed the Mega Mock Drill. Shri Rinkesh Roy, IRTS, Chairman, PPT Trust congratulated the participants of Mega Mock Drill team of Paradip Port Trust for arranging such a Mega Drill in a befitting manner by incorporating Oil Spillage control, onshore and offshore fire fighting, in consultation with all sister industries situated in Jagatsinghpur District. The observations noticed by the internal and external observers were taken positively for rectification. Paradip Port Trust organised an event at the local Jagruty School on the occasion of International Day of Persons With Disabilities. Gracing the occasion as Chief Guest, Shri Rinkesh Roy, Chairman, PPT saluted the spirit of determination of the school children and mentioned that PPT would take necessary steps within its ambit for the all-round development of the school. He also emphasized on conducting a survey, so as to include more such local children in school curriculum. Shri Roy inaugurated a Children’s Park and Guest of Honour Smt. Subhalaxmi Roy, President, Paradip Ladies Club inaugurated the Kitchen Room at Jagruty. Shri Roy felicitated Shri U.K. Dubey, Paradip Unit Head of TISCO, who has contributed for installation of playing equipment in the premises of Children’s Park at Jagruty as well as other developmental activities. Dr. R. K. Mallick, Sr. Dy. CMO, PPT Hospital was felicitated for donating Rs. 3 Lakh in the memory of his beloved late wife Dr. Pratima Behera, former Dy. CMO of PPT Hospital for utilization in the betterment of Children at Jagruty. Shri Roy also announced about introduction of a 50 seated bus service towards transportation facilities of children of Jagruty. 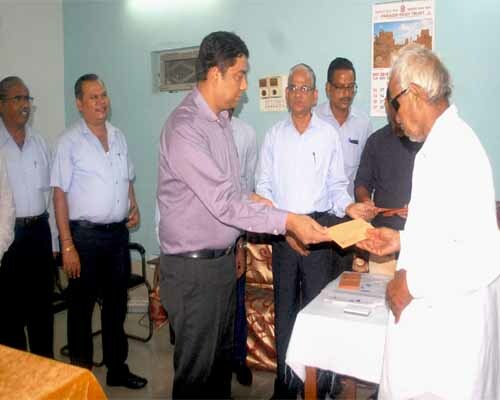 He distributed gifts to the differently abled employees of Paradip Port Trust as well as Children of Jagruty. Paradip Ladies Club led by Smt. Subhalaxmi Roy donated Rs. 20,000/- towards development of Jagruty. Smt. 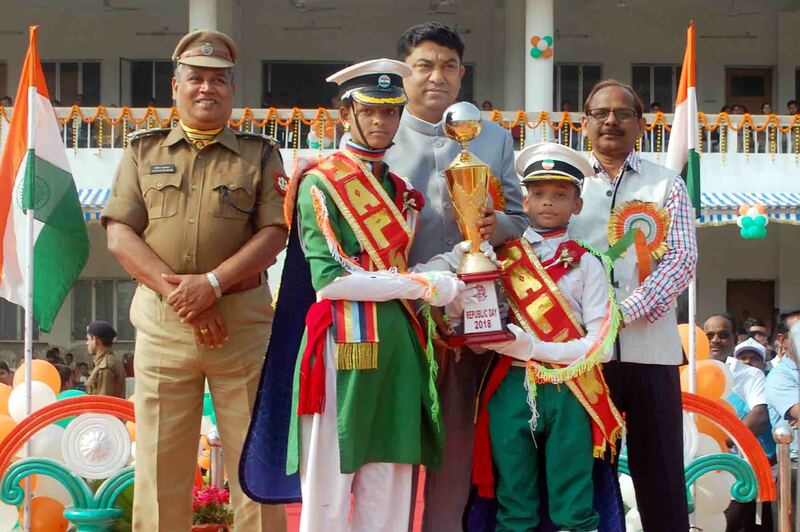 Roy awarded prizes to the winners of different competitions held among the school children. Shri U R Mohan Raju, Secretary, PPT highlighted how the Port Administration has extended facilities of employment under PWD category. Shri Raju also donated Rs. 5,000/- towards development of Jagruty. Shri Prasant Kumar Moharana, Sr. Accounts officer, PPT as well as Secretary, Jagruty presented the Annual report of Jagruty. The differently abled children of Jagruty presented Cultural activities under the able guidance of Smt. Nalini Mohanty, Principal of Jagruty. Shri Marshal Tito, Welfare Officer, PPT gave the welcome speech and Shri Rama Chandra Pradhan, PPT Jr. Welfare Officer, PPT extended vote of thanks. World AIDS Day was observed by Paradip Port today on 1st December 2018 beginning with a road rally and an awareness programme organised on the occasion. It was flagged off from PPT Hospital by Smt. Subhalaxmi Roy, President, Paradip Ladies Club, which comprised of denizens of Paradip, local school children, CISF Personnel, Transgenders, volunteers of PSS and this culminated at Administrative Building of PPT. A meeting was held within the premises of Administrative Building. Smt. Subhalaxmi Roy, President, Paradip Ladies Club graced the occasion as Chief Guest and Shri U R Mohan Raju, Secretary, PPT, Shri S.K. Sahu, FA & CAO, Shri A.K. Mohapatra, Dy. Conservator, Dr. P. Panda, CMO, PPT Hospital were among the other dignitaries present on the occasion. Dr. Panda explained the causes, symptoms and preventive measures to control the HIV. Paradip Sakshyrata Samiti (PSS) had joined hands with local NGOs IRDMS and CIST to observe World AIDS Day 2018 with the theme - “Know Your Status”. Er. Shusil Chandra Nahak, Dy. Chairman, PSS gave the welcome speech. Shri Pravat Kumar Das, Manger, Corp. Legal, PPT and Shri Ashok Mohapatra from PSS co-ordinated the event. Prizes were awarded to the winners of Debate competitions held among the local school children on the occasion by Smt. Subhalaxmi Roy, President, Paradip Ladies Club. Free HIV tests for the Truck drivers & Helpers were undertaken by PPT Hospital at Gate No. 3 of the Port. The Port Day was observed on the auspicious day of Kartik Purnima by the Paradip Port Trust Authorities on 23-11-2018 as being done every year. On this occasion, Shri Rinkesh Roy, Chairman, Paradip Port Trust attended the function as Chief Guest and unfurled the Paradip Port Flag at Wet Basin in the morning. 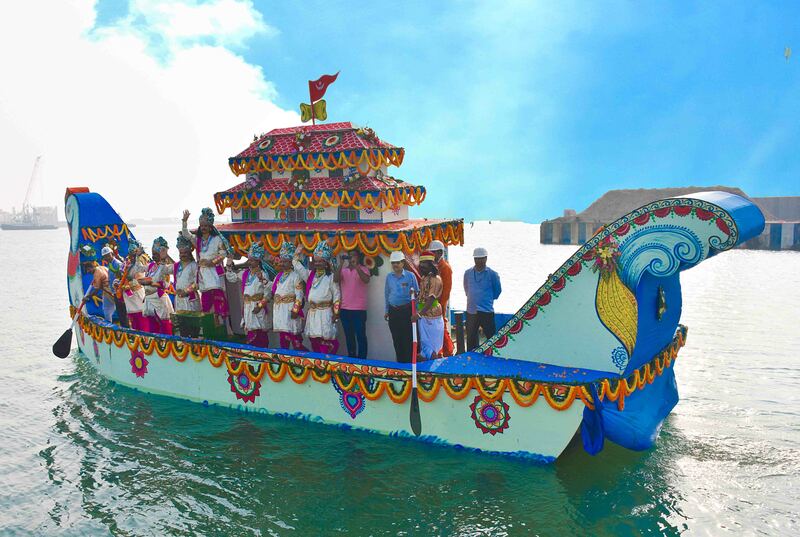 He performed the traditional Kalas Puja & handed over the sacred Kalas to the Sadhavas who set sail on board a traditionally decorated boat. He also inspected the Port Marine crafts lined up in the Harbour and took salute. Thereafter Dy. Conservator, Paradip Port Capt. A.K. Mohapatra welcomed the guests in the meeting and explained the importance of Port Day celebration. Extending his greetings to the gathering on the auspicious occasion of Kartika Purnima, Shri Rinkesh Roy, Chairman, Paradip Port Trust lauded the Marine Deptt. achievement of a commendable 27 vessel movements in 24 Hrs. and also for the first time Mediterranean Mooring type berthing of ship carrying edible oil in the Eastern Coast. He informed that Rs. 3,500 Cr. Port modernization programme is in full swing, which will result in capacity augmentation of 55-60 MMT over the existing capacity, thus by enabling the Port to become the No. 1 Port in the country in terms of cargo handling. For providing safe drinking water to the local community, a Desalination Project in consulation with National Institute of Ocean Technology will be taken up and is expected to be commissioned by December, 2019. PPT Board has approved for 350 Nos. New Quarters for the employees. In order to curb pollution and dust suppression, constructions of concrete roads has already been started in the township. Dry Fog Dust Suppression System has been implemented at Mechanised Coal Handing Plant (MCHP) for unloading the coal from the Rail Wagon without spreading of coal dust. For the first time among Major Ports, Group Insurance Scheme covering both employees and contractual workers has been implemented in PPT. For the benefit of local fishing community, PPT will spend around Rs. 15 Cr. by this year end for dredging the Confluence Point of River Mahanadi. Under CSR, PPT has provided financial assistance to the Jaipur Weaver Craft Village, where the local weavers can sell their handloom products. Besides, many other programmes aiming for upliftment of the needy people around the Port township are being taken up by the Port Authority. Shri K Ramchandra Rao, Chief Engineer, PPT who attended as Guest of Honour and threw light on the overall development of Paradip Port. Finally, Shri S.K. Sahu, FA & CAO, Paradip Port Trust extended vote of thanks. Paradip Port Trust has made a paradigm shift on 06.11.18 by introducingshiploading of 20,112MT of blendedcoal in the vessel M.V Diamond Star containing high grade coal of ECL(G4 grade)with low grade coal of MCL(G12 grade) at the ratio of 35%:65%to achieve a higher GCV suitable for Vallure Thermal power station of M/s NTECL. Thermal power plants blend high grade coal with low grade coal to achieve the intended Gross Calorific Value(GCV) at the power plant end. Mostly the high grade coal is imported from Indonesia. In India high grade coal with high GCV is available in ECL,CCL& SECL as against abundance supply of low grade coal from MCL. Possibly for the first time in India, two different grades of domestic coal were blended at a Port to achieve the same effect of blending with imported coal. This would be in the direction of import substitution of Indonesian coal and will go a long way in saving precious foreign exchange for the country. In the blending process carried out at the MechanisedCoal Handling Plant of PPT,02 different grades ofcoal from different collieries were homogeneously blended by mechanised process.Re-circulation of high grade coal from Stackyard through Reclaimers& low grade coal unloaded directly from wagons will pass through a common junction house to form blended coal as per the desired ratio. Homogeneous blending to ensure the blend remains consistent. Controlled automated blending system by programmable logic control to maintain accurate blending ratio. Creation of Thermal Coal hub for availability of desired grade of blended coal on F.O.B basis. Reduction in inventory cost of Thermal Power Plants. Import Substitution resulting in substantial savings of Foreign Exchequer. Major activities of Thermal Power Plant i.e handling of different grade of Thermal Coals, blending operation can be eliminated there by saving on time & cost. No additional cost for blending operations resulting in reduction of generation cost. Mechanised coal handling plant(MCHP) of PPT commissioned in Sept. 2001 is one of the premier bulk material handling system in Asia. The plant is equipped with state of the art technology and serves the purpose of exporting thermal coal to the power plants in southern India. Since inception, the plant has achieved many milestones in operational parameters like high berth productivity,minimum turn-around time of vessels which are at par with international standardsFurther dual loading of vessels using two shiploaders simultaneously is one of the major achievements of the plant. The valedictory function of observance of the Weeklong Vigilance Awareness Week by Paradip Port Trust was held in the Officer’s Club premises on 03.11.2018. Shri H.S. Rout, Dy. 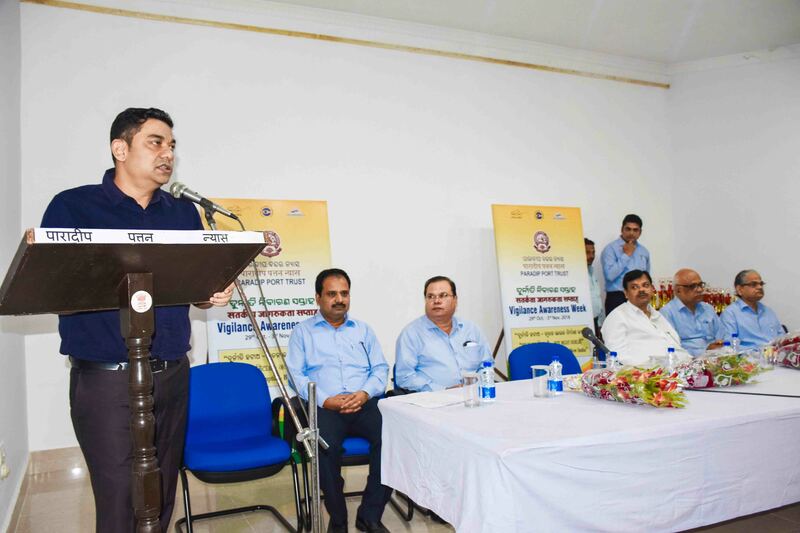 CVO, Paradip Port Trust while welcoming the guests informed about the programmes undertaken by Vigilance Dept. of PPT for observation of Vigilance Awareness Week at Paradip Port. Gracing the occasion as Chief Guest, Shri Rinkesh Roy, Chairman, PPT told that Professional Honesty is the need of the hour and one should not succumb to external pressure. Self introspection can do wonders. Whatever we do, we must do with a great deal of sincerity and passion. Right value system should be inculcated in younger generations and character building should be given topmost priority, which lies especially in the hands of our school teachers. Empathy to less privileged and laying a helping hand to elders should be their aim. Shri Prakash Mishra, PRO, PPT read out the Message of Shri. S.K. Sadangi, CVO, PPT. Thereafter, prizes were given to the winners of various competitions organised among the school students during this week. Shri DP Mishra, AEE, Vigilance Dept., PPT offered vote of thanks. Paradip Port Trust observed Rastriya Ekta Diwas (National Unity Day) on 31.10.2018 on the occasion of the birth Anniversary of Sardar Vallabhbhai Patel. Shri Rinkesh Roy, Chairman, PPT offered floral tribute to Sardar Vallabhbhai Patel along with PPT Employees. Thereafter, Shri Roy administered Rastriya Ekta Diwas pledge to the officers and employees of PPT in the Administrative Building premises. In the afternoon, a National Unity Walkathon comprising sports trainees of PPT was flagged off by Shri S. K. Sahu, FA & CAO. The contingent went around the township spreading message of National Unity. Shri Sahu took salute from the march past combining contingents from the Paradip Port High School Naval NCC, Paradip College Naval NCC, students from Odisha Maritime Academy and CISF Unit, PPT. As per the directions from Central Vigilance Commission, Paradip Port Trust is observing Vigilance Awareness Week from 29th Oct 2018 to 3rd Nov. 2018. The week long function started with administering pledge by Shri K. Ramachandra Rao, Chief Engineer, PPT to the employees of PPT on 29.10.2018 at 11.00 AM. In the afternoon, an interaction with newly recruited employees was held at Officers’ Club, in which they were briefed about Anti-Corruption Acts & Rules. Various competitions like Essay, Painting, Elocution and Quiz competitions among the PPT Employees, local school students and other activities relating to Vigilance Awareness are scheduled during this week long observance. PPT Employees are also taking Integrity - e-pledge through PPT Website and website of CVC. Each Department of PPT is also conducting a stakeholders meet during the week, for awareness on corruption issues relating to the functioning of their particular Departments. Several Hoardings have been displayed in the locality for creating awareness among the public as the theme for this year’s Vigilance Awareness Week is “Eradicate Corruption – Build A New India”. The valedictory function will be held on 3rd November 2018, wherein the prizes will be distributed. It was an innovative way of handling oil cargo for PPT, when a tanker “MV Delfine” sailed into Inner Harbour carrying 8,000 Metric Tonnes of Palm Oil for Adani Wilmar Group and made Mediterranean Mooring type of berthing off Fertilizer Berth No. 1. The Vessel having Overall Length of 117.60 Meter and 19 Meter beam was manoeuvred by Capt. Sridev under the guidance of Dy. Conservator & Harbour Master of Marine Deptt., PPT. It is unparalleled, prospective game changer for PPT, as it represents the beginning of cargo handling conducted in a ship with Mediterranean Mooring type of berthing. By this method, cargo handling quantity of PPT will increase, without addition of any infrastructure. Paradip Port leads the way, all the way. Paradip Port has added yet another feather to its cap by successfully completing movement of 27 vessels within 20 Hrs. i.e. from the period of 6.00 AM on 13th October 2018 to 2.00 AM on 14th October 2018. In the first shift - 12 no. of vessels, in the 2nd shift - 11 No. vessels, in the third shift - 4 no. of vessels were handled by the Marine Deptt. of PPT. Above includes 16 berthing, 1 Single Point Mooring, 3 Outward movement of Vessels, 1 shifting from one berth to another berth and 6 smaller vessel movements. 16 berthing movements is a rare feat as most of the berths were vacant due to the passing of Cyclone Titli and cargo operation / shipping movements were stopped for the previous two days. The stoppage of Port operations for the above two days was recovered in a single day. Despite having no control over the impending natural calamities from time to time, the way PPT recovered shows the vibrant mindset of its employees to convert challenges as opportunities. It also resulted in highest single day cargo handling of 6,39,000 MT surpassing previous record of 5,34,000 MT achieved on 25th September 2018. This record achievement could be possible due to responsive Marine Pilots & Staff of PPT, Able guidance of Dy. Conservator, PPT, concerned stevedores and the co-operation extended by the Traffic Deptt. Previous record stood at 24 vessels handled by PPT in a period of 24 Hrs on 3rd December, 2017. Paradip Port is now gearing up to enhance the Cargo throughput as it is vying for the coveted top position in the Country with a slew of other infrastructure and modernisation facilities of the Port. Swachhta Hi Seva & Swachhta Pakhwada at Paradip Port came to an end today on 03.10.2018 with the valedictory function held at Jaydev Sadan. Chief Guest on the occasion Shri Rinkesh Roy, Chairman, PPT told that cleanliness should be an integral part of our day today life. Highlighting the measures taken by the Port Authority to curb air and water pollution in the locality, he told about the inception of Dry Fog Dust Suppression System at Mechanised Coal Handing Plant (MCHP) on the occasion of Gandhi Jayanti, which is one of its kind in Asia. 35% of total port traffic is normally received at Rail Receival Station of both MCHP and Iron Ore Handling Plant (IOHP). The new system will ensure good quality of air in the surroundings. Similarly, he told about the upcoming project of clean drinking water through a new Desalination Plant in association with National Institute of Ocean Technology. Shri S.K. Sahu, FA & CAO, PPT while welcoming the guests, briefed on the swachhta activities conducted during the last fortnight at PPT. A visual presentation on activities conducted by the Port for the last fortnight, along with Paradip Municipality and Paradip Sakshyarata Samity Members was shown. Paradip Municipality was awarded a prize for its co-operation and active participation in the Swachhta Pakhwada by Chairman, PPT. The employees of the Marine, Traffic Dept., Finance Deptt. and members of Paradip Sakshyrata Samity were also awarded. Awards were also presented to the representatives of Local Schools and Shops, which have maintained their work areas clean. A street play named “Chakulia Panda” on Swachhta Awareness was staged by a local cultural organisation CANMASS. The World Heart Day was observed at PPT Hospital today on 29.09.2018. On this occasion, a walkathon was organised to create awareness about heart related problems among the denizens of the Port township. Smt. Subhalaxmi Roy, President, Paradip Ladies Club, flagged off a walkathon in which the doctors, paramedical staffs of the PPT Hospital along with HoDs of the PPT, CISF personnel and general public participated with much enthusiasm. 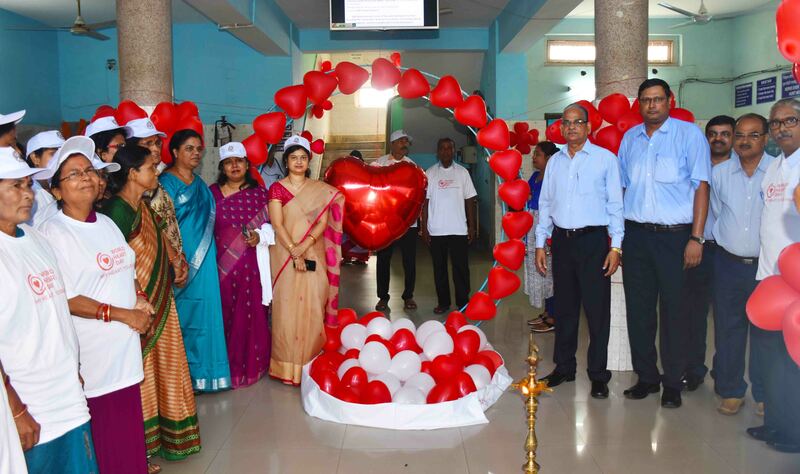 Free Heart Check Up was also conducted in association with eminent Cardiologist from AMRI & Sunshine Hospitals, Bhubaneswar and Agarwal Eye Hospital, Cuttack. Dr. L Padhuria, Sr. Medical Officer and Dr. Durga Prasad Sethy, Ophthalmologist of PPT Hospital co-ordinated the event under the guidance of Dr. Prahlad Panda, Chief Medical Officer, PPT. A total number of 317 people attended, out of which 36 new cases of Diabetes and Coronary Artery disease were detected. One acute case of heart attack was immediately referred to higher centre. 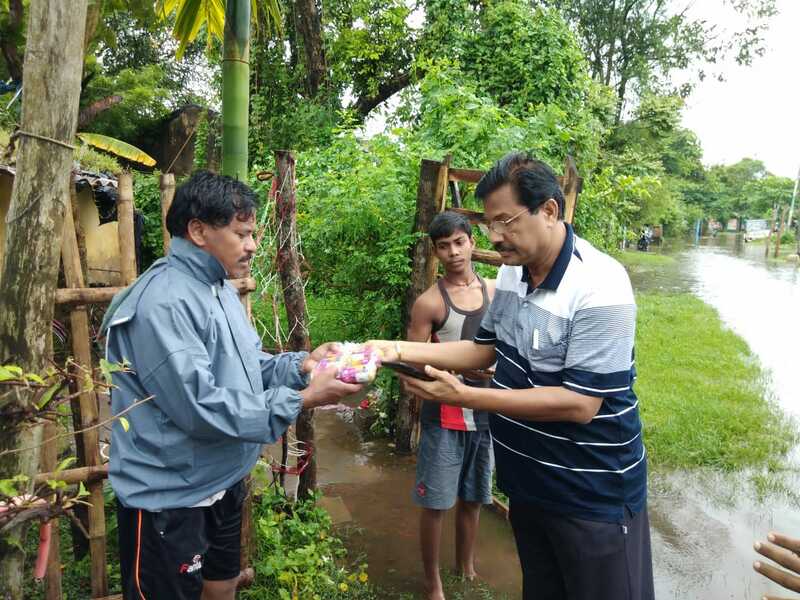 As the Cyclonic storm 'DAYE' triggered heavy downpour accompanied by high velocity wind in the locality, the weeklong Viswakarma Puja celebrations in the PPT township has been disrupted to a great extent with instances of damages to the Puja Pandals and caving in of structures. Normally, hawkers and street vendors, who come to Paradip not only from the nearby areas, but also from far away places, usually put up make shift stalls for hawking their products during the local Puja Celebrations. But, the inclement weather has severely dented their business. PPT normally allots open spaces to these people by floating tender. PPT Management, however taking a sympathetic view of the above circumstances, as a goodwill gesture decided to refund the money collected from these small stalls and cycle stands etc. The refund process has started. This has given relief to the poor hawkers and stall owners, who were otherwise facing the prospect of losses. As a part of Port Modernisation and infrastructure development, a casket of new developmental infrastructures have been inaugurated this evening by Shri Rinkesh Roy, Chairman, PPT. 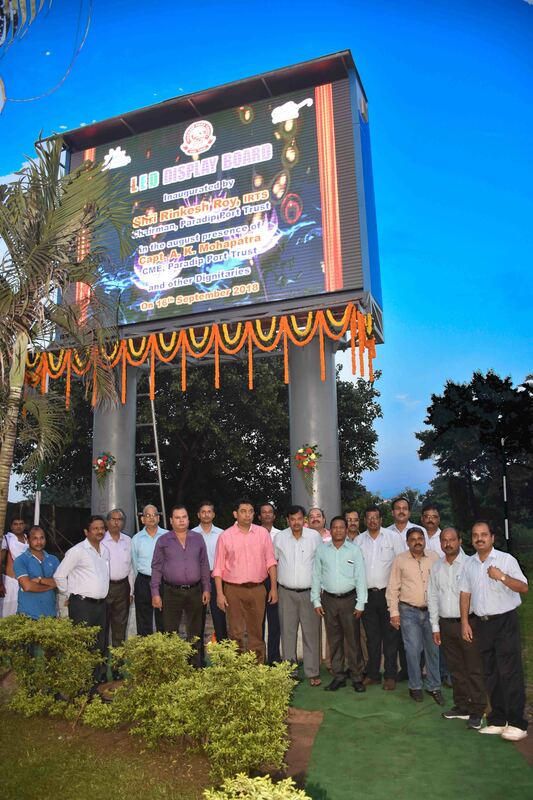 He went and inaugurated Large Electronic Display Board at Biju Patnaik Park, Atharbanki and another one at the entrance of Administrative Building, PPT. These will showcase various functions of PPT from time to time. A new state of the art 132/33/11 KV Control Room was inaugurated at Main Receiving Station of PPT along with the expansion of existing 132/33 KV Sub-station for effective power distribution to the Deep Draught Iron Ore & Deep Draught Coal Terminals taken up on BOT basis.A new 11 KV Load Centre was inaugurated near Marine Jetty, which will facilitate effective power supply to the newly commissioned Clean Cargo Terminal of PICTPL, which has recently come up BOT basis. Lift Systems at PPT Hospital and Administrative Buildings have also been inaugurated. Departmentally built Cantilever / Cable Stayed Bridge across the Creek was dedicated to the public. This state of the art design is one of its kind in the locality and it is mostly built with scraps and discarded materials. PPT began the observation of Swachhta Hi Seva and Swachhata Pakhwada from 15th September to 2nd October 2018, under the instructions of the Govt. of India. The observation started by taking “Swachhata Pledge” by all PPT officers and employees on 15.09.2018 at 11.00 Hrs in front of Administrative Building. Chairman, PPT Shri Rinkesh Roy administered the pledge. Thereafter, a Street Play named “Chakulia Panda” was performed by local cultural organisation Canmass in front of Administrative Building and near Kabarkhana Market to make the denizens aware about the Swachhta. PPT has already drawn up fortnightly plan on the occasion of Swachhta Hi Seva and Swachhata Pakhwada viz. awareness drive among workers and staffs of all Departments & Divisions of PPT and local community, cleaning activities in colonies and sites, organisation of swachhata awareness workshop in local schools, cleanliness drive in local slums, display of swachhata awareness hoardings and digital display at important locations in the township. With intensifying of the low pressure over North-west Bay of Bengal into a depression, heavy rain pounded, Paradip Township and adjoining areas which has recorded a maximum of 412 mm rain in last 24 hours. It is almost 30% of annual rainfall that the locality receives in a year. As the rainbrought normal life to standstill, several areas of Paradip Port including its prohibited areas witnessed waterlogging. PPT officials evacuated 250 labourers from the Tarinigada catchment areas and provided them shelter in the PPT Trade Centre building by deploying transportation facilities. 6.5 tonnes of flattened rice, biscuits, bottled water, molasses and sugar were distributed among the affected people in the Port Township as well as in the adjacent areas. PPT Hospital with a dedicated team of doctors are on the vigil to provide first aids to the public. Engineering Deptt.pressed high-powered pumps in several areas to drain out excess water. PPT machinery is geared in full preparedness to meet any eventuality and aControl Room has been established under the supervision of Shri S.K. Sahu, FA & CAO, PPT at Gate No. 4. Though the heavy rains crippled normal life, Port Operations were smooth and normal. ShriRinkesh Roy, Chairman, PPT is personally monitoring the situation and the life in the township is gradually returning to normalcy. The 72nd Independence Day was celebrated by Paradip Port Trust Authority. Shri Rinkesh Roy, Chairman, PPT unfurled the National Flag and took salute from platoons consisting of CISF Jawans today in the morning at Gopabandhu Stadium. Addressing on the occasion, Chairman, PPT informed that PPT has been consistently maintaining the 2nd position in terms of traffic handled amongst all Major Ports. It has undertaken great strides in each area of its activities and has witnessed 11 % growth in terms of cargo handling in this fiscal, compared to last year during the corresponding period. Cargo handling operations have commenced from March, 2018 in the Multi-purpose Clean Cargo Berth of 5 MMTPA capacity for handling of containers and other clean cargo. A New Iron Ore Berth is expected to be operational by this year end. Construction of LPG Terminal at South Oil Jetty by IOCL of 0.75 MMTPA capacity is in full swing. PPT is going to award a project for Deepening and optimization of Inner Harbour facilities including development of Western Dock Captive Berth (2 Nos.) of 30 MMTPA capacity to handle Cape-size vessels with an estimated cost of Rs. 2000 Cr. For the welfare of employees, Shri Roy announced the introduction of Group Insurance Scheme under which coverage will be given to PPT Officials & Employees as well as workers, in case of natural or accidental deaths and permanent disability. For the benefits of local fishing community, PPT will take up the work of Mahanadi Mouth opening by November-December of this year. For the benefits of denizens of the locality, PPT will implement Super Speciality Hospital Project in the lines of Golden Share Model Hospital finalized for Mumbai Port Trust by the Ministry of Shipping. Under CSR scheme, PPT Hospital has extended free cataract operations benefits to 200 poor persons in the locality last year and in the current fiscal the target is 250. Under Smart Port City Project, PPT has undertaken different measures like creek side development, landscaping, construction of Sewage Treatment Plants. Installation of Industrial RO Water Purifiers at different operating locations is being done to provide clean and safe drinking water. Work on Desalination Plant of 10 MLD capacity is targeted for awarding this year, which will solve the drinking water woes in the Port township. It has come to the notice of Paradip Port authorities that some Newspapers have carried out misleading News for the last few days regarding irregularities in recent recruitments in PPT and against Secretary, Deputy Secretary. PPT recruitments are being systematically handled as per the laid down Rules and Regulations thoroughly. The allegations that there are irregularities in recruitments are totally false, baseless and misleading. In the recent past to maintain fairness & transparency in the process of recruitment, the written examinations are being conducted by reputed organisations or institutions like National Productivity Council or Indian Maritime University (IMU). No PPT Officer - either Secretary or Deputy Secretary or any other officer are involved in any of the above processes of written test i.e., setting up question paper and evaluation. The results are announced in PPT website openly for information of candidates / general public. High and strict precautions have been taken by PPT and hence, allegations published are completely false and biased. In the instant case of Assistant Secretary Gr.I, the written test was conducted by IMU, which is a Central Government University. Setting of question paper and evaluation of the answer scripts are entirely done by Indian Maritime University, and no Port Officer is involved in the same. Some vested interests, who have failed to manipulate the recruitments, are resorting to un-ethical methods of making false allegations, with an intention to harass the officers. PPT condemns these unsavory actions of some people. The 4th International Day of Yoga has been observed by Paradip Port Trust with much enthusiasm on 21.06.2018. Shri Rinkesh Roy, Chairman, PPT inaugurated the Yoga demonstration programme by lighting the sacred lamp at Golden Jubilee Park in the morning along withShri N. Vaiyapuri, Dy. Chairman, PPT, Shri U R Mohan Raju, Secretary, Smt. Subhalaxmi Roy, President, Paradip Ladies Club and other HODs.Officers & Employees of Paradip Port Trust, CISF personnel of PPT Unit, Paradip Ladies Club Members and residents of the Port Township actively participated in large number in the programme which was organized at 2 venues i.e. Golden Jubilee Park and Gopabandhu Stadium. Kanhu Bhai, Yoga Trainer from Prajapita Brahmakumaris Ishwariya Vishwa Vidyalaya, Paradip conducted the progamme at Golden Jubilee Park assisted by Sister Jasmine and Capt. Amit Kumar from the said organization. Yoga Trainer Shri Biswajit Jena, from the Art of Living, Paradip conducted Yoga programme with assistance from Shri Tapas Ranjan Pati at Gopabandhu Stadium. Practice sessions were also held on 19th and 20th June for the preparation of the participants. The Administrative Building and the Officer’s Club have been illuminated along with conspicuous display of message of 4th International Day of Yoga at different locations of Paradip. On Dt. 26.05.2018, Mechanised coal handling plant(MCHP) of Paradip Port Trust has loaded thermal coal of 86,896 MT for Andhra Pradesh Power Development Corporation (APPDCL) to one Panamax vessel i.e ‘M.V. Indus Fortune’ chartered by M/s. Bothra Shipping Services Pvt.Ltd., surpassing all previous records. The above quantity was loaded using two ship loaders in record time of 17:51 hrs & 16:00 hrs i.e. berthing to de-berthing & clearance to completion there by achieving the record productivity of 1,16,835 TPD & 1,30,344 TPD respectively. The feat was made possible due to close co-ordination & monitoring by PPT officials & whole hearted support extended by Vessel Crew, Agents & Exporter. This has been appreciated by all…. In order to cater to needs of the denizens from the peripheral areas of Paradip Port, free cataract operations have been conducted on 200 poor persons at PPT Hospital in a year under CSR scheme. In a meeting held in the Conference Hall of the Hospital, today on 16.05.2018, cheques towards spectacle assistance have been distributed for post-operation care. While distributing the cheques, Shri Rineksh Roy, Chairman, Paradip Port Trust congratulated the Dr. P. Panda, Chief Medical Officer, Dr. D.P. Sethy, Ophthalmologist who carried out the successful operations along with the Medical Staff in association with the Paradip Sakshyrata Samity. Smt. Subhalaxmi Roy, President, Paradip Ladies Club & other HODs of PPT were also present on the occasion. Further, the Port Authorities have set a target of 250 free cataract operations of the unprivileged people from the periphery to be conducted in the current fiscal. It is to be noted that, PPT Hospital is currently equipped with state of the art ophthalmic and other equipments. Paradip Port Trust Authorities have taken a decision for providing higher type Qtrs to the employees and workers . The decision has been taken to provide such benefits to the employees for better standard of living conditions. PPT has also allotted 32 nos of Qtrs to the Contract workers those who are being engaged in emergency works such as railway, water supply and electricity, which has been vacated by the retired employees occupying the Qtrs for a long period. In Paradip Port Trust, retired employees are occupying the Port quarters after their retirement and beyond the maximum permissible period i.e. one year. Many of the retired employees are staying in the quarters for more than 13 years and it is found that some of them have also sub-let their quarters to outsiders and are collecting rent for the same. At the same time, Port is finding it difficult to give accommodation to people genuinely involved in the running of Port and Port operation. Workers involved in maintenance of railway tracks are also not finding any accommodation at Paradip for which they have to commute from Kujang and beyond to do their duty. Port is losing traffic and revenue due to delay in restoration of railway services for this only. Similar is the case of workers involved in other emergency services of the Port like water supply, electricity and plant operations. While these retirees are enjoying undue benefits, genuine workers to the extent of approximately 700 to 800 have to stay far away from their worksites and face considerable difficulties. Even demands from State Government and Central Government Offices in Paradip for accommodation are not being met by the Port. The Port authorities also pointed out that recent Supreme Court Judgments have been very categorical in eviction of high dignitaries from their government accommodations beyond their stipulated periods. The Port authorities also clarify that these retirees in unauthorized occupation of quarters can get medical facilities of PPT on payment. 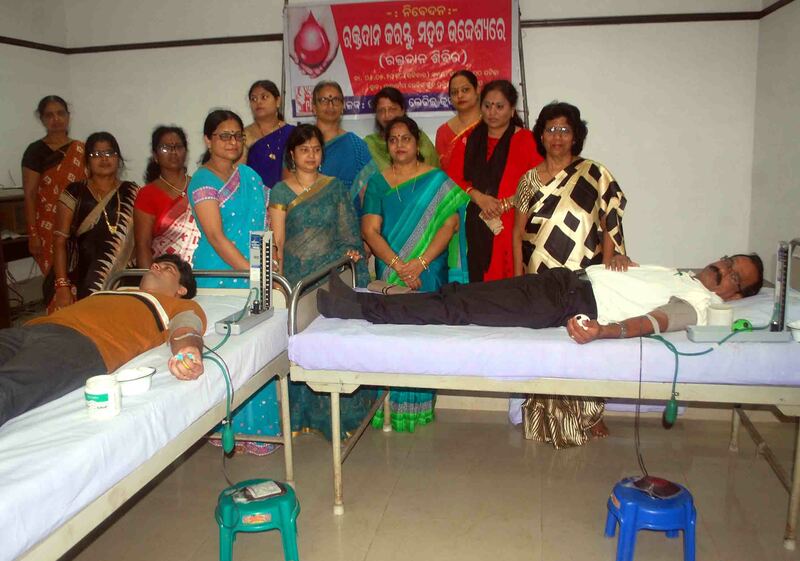 Paradip Ladies Club for inculcating the spirit of social activism among the denizens of Paradip today organized a Blood Donation Camp at its office premises. Gracing the occasion as Chief Guest Shri Rinkesh Roy, Chairman, PPT inaugurated the event. Guest of Honour Shri Rajesh Makwana, DIG/Commandant, Coast Guard, Paradip, Smt. Subhalaxmi Roy, President, Paradip Ladies Club, Smt. Kalpana Sahu, Secretary, Shri S.K. Sahu, FA & CAO, Shri U R Mohan Raju, Secretary, PPT, other HODs and ladies club members were also present. Apart from officers and employees of Paradip, Members of Paradip Banika Sangha, Students of Orissa Maritime Academy & Gopabandhu Kreeda Sansad, overwhelming number of volunteers from Paradip Sakshyarata Samiti, CISF & Coast Guard Units of Paradip donated blood with vivacity. Assisted by the staffs from Red Cross Wing, Jagatsinghpur around 200 units of blood were collected. Shri Gopal Krishna, IAS, Hon’ble Secretary, Ministry of Shipping, Govt. of India has made a one day visit to Paradip Port Trust on 03.05.2018, as a part of regular review. Shri Rinkesh Roy, Chairman, Paradip Port Trust along with other HODs of PPT received him and explained the progress of the ongoing projects in the Port and gave a vivid account of various activities undertaken for augmentation of Port Capacity, in a review meeting held at the Board Room of PPT. Secretary, Shipping expressed his satisfaction on the progress of the projects undertaken by Paradip Port Trust and congratulated the PPT Chairman and his team for the excellent growth of the Port and especially for achieving the coveted 100 MMT mark in the last financial year in terms of cargo handling. During his visit, Shri Gopal Krishna also had interactions with stakeholders of Port and visited the Port Township. Coinciding with month long 100 MMT Celebrations, first ever day night cricket tournament was held by PPT under the aegis of Gopabandhu Kreeda Sansad (GKS) from 10th April to 15th April, 2018 in which all the 8 Departments of PPT participated. 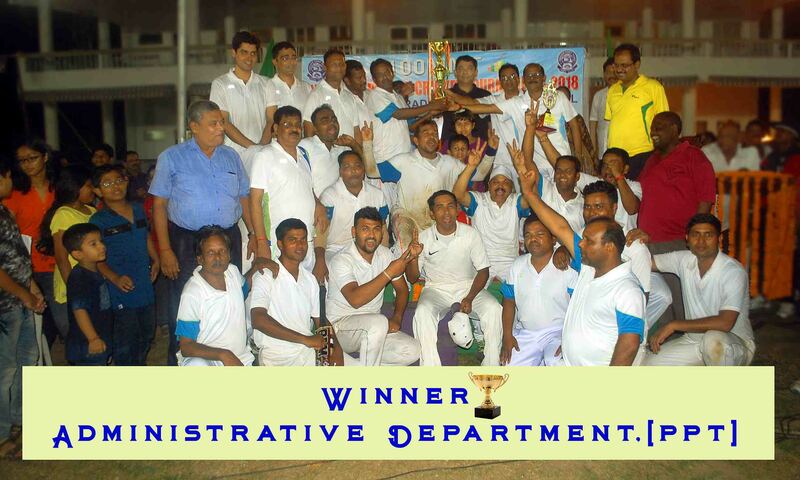 In the final match played on 15.04.2018 evening, Administrative Department stood as a winner. After winning the toss against Finance & Accounts Deptt., Administrative Deptt. elected to bat first and scored formidable total of 201 runs for the loss of 4 wickets in the stipulated 15 overs. Shri Ajay Kumar Behera of Administrative Deptt. was the highest scorer with 71 runs. Chasing the required target, the Finance & Accounts Deptt. was bundled out for 21 runs in mere 7.1 overs. Shri Behera was adjudged Best Batsman. Shri Rama Chandra Mohanty of Administrative Deptt. was given the Best all rounder performance award, Shri Biswa Ranjan Das of Administrative Deptt. was the Best Bowler and Shri Subhendu Mohanty of Traffic Deptt. was awarded for highest number of sixes. Finance & Accounts Deptt. was the second Runners Up and E&M Deptt. got the second runners up award. Medical Deptt. bagged the Best Disciplined Team Award. Shri Rinkesh Roy, Chairman, PPT gave away the prizes in presence of Shri N. Vaiyapuri, Dy. Chairman, PPT, Smt. Subhalaxmi Roy, President, Paradip Ladies Club and Shri A. Jayasimha, President, GKS. 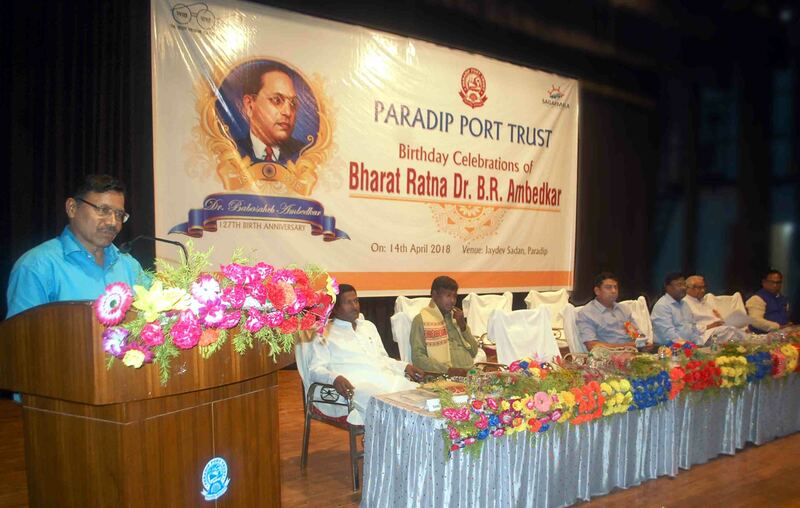 Paradip Port Trust (PPT) celebrated the Birth Anniversary of Bharat Ratna Dr. B R Ambedkar with much fervour on Saturday. The PPT fraternity led by Shri Rineksh Roy, Chairman, PPT including HODs, Senior officers, employees and representatives of trade unions and Paradip Port Trust SC & ST Employees Welfare Associations, offered floral tributes at statue of Dr Ambedkar in the morning. In the evening, a meeting was held at the Jayadev Sadan with PPT Deputy Chairman Shri N. Vaiyapuri presiding over it. Gracing the occasion as Chief Guest, Dr. Kulamani Samal, MP, LS, Jagastsinghpur said that the auspicious day reminds the country about several improvements still to be done for up-liftment of the marginalised section in the society. Congratulating PPT management for achieving coveted 100 MMT mark in cargo handling, he advised to do more things for the periphery development. Chief Speaker Shri Ganeswar Behera, former minister described Dr. Ambedkar as the crusader of downtrodden and deprived people. Special invitee Shri Anchal Das, former MP told depived people to educate and organise for all-round development. Shri Bhajaman Behera, former Union Minister gave a vivid account of Dr. Ambedkar’s life, works and philosophy. Former MP Bibhu Prasad Tarai narrated the relevance of the thoughts and guidance of Dr Ambedkar in the prevailing social and economic conditions of India. Guest of Honour Shri Rinkesh Roy highlighted how the architect of Indian Constitution Dr. Ambedkar established Universal Rights to Vote and Rule of law concepts. PPT Secretary Shri U R Mohan Raju gave the welcome speech and Shri Prakash Mishra, PRO offered vote of thanks. Two books authored by Shri Anchal Das, former MP were released on the occasion. Notebooks and pens were presented to needy students and a cultural programme was presented by the artistes from Sagarika Kala Niketan. 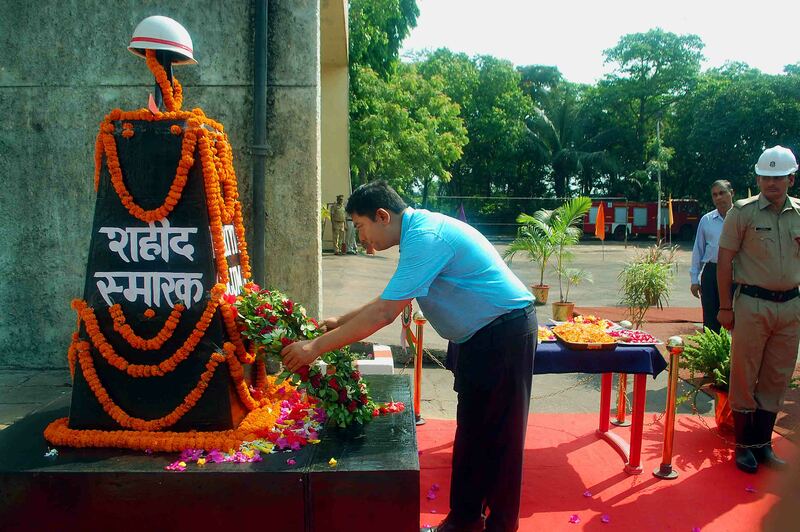 The CISF Fire Wing of Paradip Port Trust celebrated “NATIONAL FIRE SERVICE DAY” on 14th April, to pay homage to Firemen and Officers who lost their lives in Bombay Dock Explosion on 14th April 1944 and in subsequent occasions at Main Fire Station. A Month long awareness programmes from 15-03-2018 to 14-04-2018 were arranged to provide unique opportunity to educate the people aware about fire hazards, fire prevention, firefighting & fire control measures etc to minimize, loss of lives & properties due to fires. The theme for the year 2018 issued by Govt. of India is “FIRE LOSS IS NATIONAL LOSS – LET US ADOPT FIRE SAFETY MEASURES”. During the Fire Safety Awareness Month, various enlightening programmes were arranged to educate the General Public, PPT Employees, Contract workers, Home Makers, School/College Children through Classes, Demonstrations, Evacuation Drill, Essay / Slogan / Quiz / Drawing Competitions etc on General Fire Safety and Home Safety. The Closing Ceremony of the “Fire Safety Awareness Month” was held at Main Fire Station on 14-04-2018. Shri Rinkesh Roy, Chairman, PPT was the Chief Guest of the occasion. Addressing the gathering, he told that fire has unique significance across various societies in the world, as it symbolizes purity. But, if it is uncontrolled, then it is potent danger to humanity. There should be well regulated systematic checks in place to avoid any fire related untoward happenings. He called upon the CISF Fire Unit to review the fire safety of local schools, hospitals and come out with valuable solutions in a time bound manner. All HODs of PPT, Heads and Fire Safety Officers from different Industries of Paradip, Port Users and Associates, School Children/Teachers of all Schools etc attended the function. Shri. B. Sundra, Commandant, CISF welcomed the invitees and Shri. R. V. K. Nair, Deputy Commandant/Fire presented the Annual Report of CISF Fire Wing and narrated about the programmes held during the month long awareness programme. All the winners of various competitions were given prizes by the Chief Guest. The CISF Fire Wing personnel presented a heart breaking live Fire Demonstration for the benefit of the public, in which Body Fire Extinction, various types LPG Fires and its extinction, High Rise Building fire & various types rescue methods, Major Oil Fire, rescue of victim from Trapped Vehicle and House, Aeroplane Accident & Fire, various Branch demonstration and at last National Flag display through three colour branches. Chairman, PPT and the participants appreciated the service rendered by CISF Fire Wing and especially the one month awareness pogramme which reached the public. One Exhibition displayed with Fire & Safety appliances, photographs of various events and drawing of the winners etc demonstrated and allowed the visitors to have a vision of it. The World Health Day was observed at PPT Hospital today on 07.04.2018 with the theme “Universal health coverage: everyone, everywhere”. On this occasion, a walkathon was organised to create awareness about problems among the denizens of the Port township. Shri Rinkesh Roy, Chairman, PPT flagged off the walkathon in which the doctors, paramedical staffs of the PPT Hospital along with HoDs of the PPT, CISF personnel and general public participated with much enthusiasm. Shri N. Vaiyapuri, Dy. Chairman, PPT inaugurated the display on medical faiclities currently available at PPT Hospital for general public. Smt. Subhalaxmi Roy, President, Paradip Ladies Club inaugurated Cervical Cancer Prevention Vaccination programme in which, adolescent girls from the locality within the age group of 9-15 years, were given vaccines. Later on, a seminar on Cervical Cancer & Cardiac Diseases was organised in the Hospital Conference Hall. Renowned Cardiologist Dr. Bibhutendra Mohanty from Sunshine Hospital, Bhubaneswar and Oncologist Dr. Ranjit Kar from HCG Panda Curie Hospital, Cuttack explained the symptoms and latest cures available for treatment of these diseases. Dr. L Padhuria, Sr. Medical Officer and Dr. Durga Prasad Sethy, Ophthalmologist of PPT Hospital co-ordinated the event under the guidance of Dr. Prahlad Panda, Chief Medical Officer, PPT. 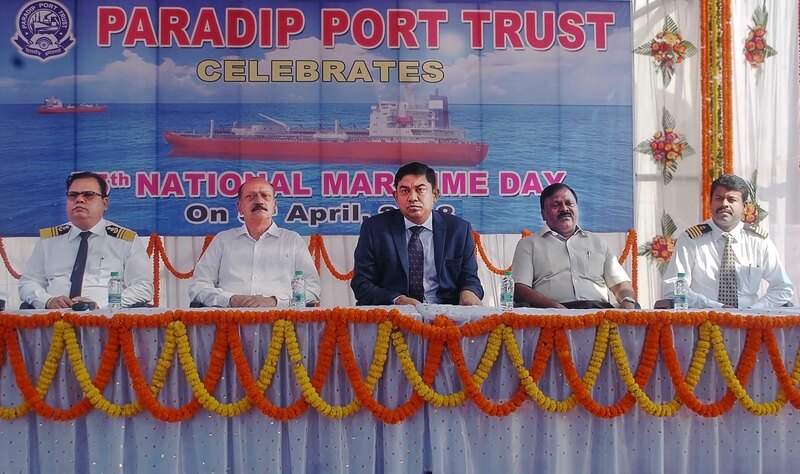 The 55th National Maritime Day was observed with gusto by Paradip Port Trust on 5 th April, 2018. Gracing the occasion as Chief Guest, Shri Rinkesh Roy, Chairman, Paradip Port Trust unfurled the National Maritime Day flag at the function held at Wet Basin of the Port in the morning. Addressing on the occasion Shri Roy, highlighted how PPT inspite of handling dry bulk cargo, became the 2nd Major Port in India by achieving coveted 102 MMT mark in terms of cargo handling in the last fiscal. He made some worthy mentions of innovations put into place by some PPT Officials and employees to realize the dream of 100 MMT mark and thus by PPT joined an exclusive club of Ports to achieve the record fate. He commended the efforts put forth despite significant reduction in staff strength. He called upon all the stakeholders to put up their best efforts, so that PPT can achieve the mission of No. 1 Port in India and the coveted 120 MMT cargo handling mark in the current fiscal. Guest of Honour Shri N. Vaiyapuri, Dy. Chairman, PPT elucidated on the importance of celebration of Maritime day and emphasized how PPT is offering the lowest cost freight services. Presiding over the function, Capt. A.K. Mohapatra, Dy. Conservator, PPT in his welcome address said that the 5th April is celebrated as National Maritime Day in India because history was created on this day in the year 1919, when the first Indian owned ship SS Loyalty, sailed from Bombay to London. Guest of Honour Shri Prithiviraj Patnaik, Sr. Chief Engineer, Marine (Retd.) was felicitated on the occasion. Several competitions relating to marine jobs were conducted amongst the employees of Paradip Port Trust, ladies present on the occasion, Indian Coast Guard, CISF and the trainees of Orissa Maritime Academy. Chief Guest Shri Roy gave away the prizes to the winners. Shri B. Sikdar, Sr. Marine Engineer of PPT tendered Vote of thanks. Last evening, a seminar was organised by Marine Deptt. with the theme “Indian Shipping - An Ocean of Opportunities” as part of Merchant Navy Week celebrations from 29th March to 5th April, 2018. Around 200 participants from the State & Central Govt. Agencies, Port Users, PPT Officials and cadets from Orissa Maritime Academy participated in the seminar. With a record cargo handling of 100.12 MT till date, Paradip Port Trust has joined an “Exclusive Club of Ports”, which have handled 100 MT or more cargo in a fiscal. Giving credit to the all the stakeholders and especially, Shri Nitin Gadkari, Hon’ble Minister of Shipping, while addressing a Press Meet held at Paradip, Chairman, PPT Shri Rinkesh Roy told, “The growth saga is a part of conscious strategy under the Sagarmala Programme of Ministry of Shipping. The Port has clocked remarkable 50% growth within last 5 years, as the cargo through put stood at 68 MT in FY 2013-14.” Shri Roy called upon all the stakeholders to wholeheartedly contribute for realizing the mission of No. 1 Port in India in terms of cargo handling in the FY 2018-19. The largest port in the country in terms of rated capacity @ 277 MTPA. The largest Dry Bulk handling port. The largest Coal handling port. The largest Coastal cargo handling port. The second largest port in terms of Traffic handled @ 100 MTPA in 2017-18. The highest OSBD (Output per Ship Berth Day) i.e the most efficient. Mechanized coal handling plant has shown improvement in efficiency from 33000 TPD to 56000 TPD and 1300 TPH to 2400 TPH in the last 3 years. Having lowest marine charges.The largest Railway Terminal in the Country in terms of rakes handled. Paradip Port Trust achieved all time traffic throughput of 100 million tones during the year 2017-18 (up to 25.03.2018), as against the previous year’s traffic of 88.95 million tonnes exhibiting a growth of 15%. During the year, the port performance parameter viz. Berth-day out-put improved to 24814 MT with 4.58% growth and the Berth Occupancy is 72% as against 67% of the previous year and handled13.55% more cargo to lead the port at par with international standard. A record quantity of 100.12 MMT of cargo handled during this Financial year (up to 25.03.2018) surpassing the previous year record of 88.95 MMT. A record quantity of 10.18 MMT of cargo handled during the month of January-2018 surpassing the previous record of 9.42 MMT handled during month of December-2017. The output of ship berth-day of 24814 MT has been achieved as against 23727 MT for the corresponding period of previous Year & exhibiting a growth of 4.58%. Successful docking of MV Urja & MV Mineral Honshu, the Cape Size Vessels with 1,00,000 MT & 1,17,983 MT Steam Coal at the Central Quay CQ-1 on 05/11/2017 & 24/11/2017 respectively. A record quantity of 5,12,467 MT of cargo handled in a single day on 25/11/2017 surpassing the previous record of 4,64,500 MT handled on 29/04/2016. All time record loading of 1,24,000 MT of Thermal Coal to MV C K Bluebell & MV Vega Aquarius at MCHP on 08/01/2018 in 24 hrs has been achieved surpassing the previous record of 1,20,600 MT on 15/01/2016. Alltime record loading of 76,208 MT of Thermal Coal has been achieved in MCHP on 13/11/2017 in 16:15 hrs with loading rate of 4690 TPH (112553 TPD) and vessel TRT of 26.28 hrs (1.1 days). Successful movement of 24 vessels within 24 Hrs. on 03.12.2017. (9 vessels in 1st Shift, 7 vessels 2nd Shift & 8 vessels in 3rd Shift) has been achieved. Handling of vessels has been improved from 140-145 per month to 175-180 per month. Night Navigation of Vessels started at South Oil Jetty. MCHP started handling of Iron Ore Pellet Vessels for first time in the Month of October 2017 and generated an additional revenue of Rs. 3.13 Crores towards handling of 574,080 MT of Iron Ore / Pellet Cargo. Simultaneous handing of VLCC Vessels at SPMs. Record quantity of 69,318 MT of Steam Coal discharged in a single day on 08/01/2018 from the cape size vessel MV Aquajoy, berthed at CQ-1 surpassing the previous record of 58,912 MT on 04/02/2017. The new Website & Mobile App. facility have been launched at PPT. The E-auction/tendering, ‘See your Ship’, Billing of cargo & vessel related charges, Billing of plot rent, GIS Mapping & Procurement through GeM (Government e Market) have been implemented. Online applications like; Online allotment of Berth & Plot, DTR update, Employee Corner, Port Operation Grievance, Issue of Harbour Entry Permit etc. 100% Cashless transactions and Aadhaar link of employees have been achieved. Taking Initiatives under Sagarmala to promote Coastal shipping, finished Fertilizer (DAP) of about 50,192 Tonnes has been shipped from Paradip to the Southern part of hinterland in Containers (922 TEUs) in about 10 Vessels replacing the earlier mode of transport, either by Rail or Road. Under Make in India Project, in the Dry Dock of Paradip Port Trust a very sophisticated Survey Vessel; “MV Sarvekshak” of Sadhav Shipping having LOA: 20.5m, Breadth: 5.5m, Depth: 2.5m, Draft: 1.35m, Speed: 13 knots & Engine: 2 x 400 BHP lunched on 10/02/2017 has been built indigenously by Sadhav Offshore Engineering Co. under Classification Society, which is the first of its kind in the State of Orissa. RFID based Harbour Entry Permit (HEP) has been introduced at Paradip Port since 25/09/2016. Enables handling of Baby Cape size Vessels. Total Capacity of 25MTPA added @ Rs. 560 Cr. The Port has taken up a host of projects to increase the capacity from existing 277 MMTPA to 325 MMTPA by 2025. Development of Multi-Purpose Berth to handle clean cargo including containers on BOT basis of 5 MTPA Capacity at an estimated cost ofRs. 430.78 Cr. and expected to be operational very soon. Development of Deep Draught Coal Berth on BOT basis for handling Import Cargo of 10MTPA capacityat an estimated Cost: Rs. 655 Cr. is expected to be operational in March, 2021. Development of Deep Draught Iron Ore Berth on BOT basis of 10 MTPA capacity at an estimated cost of Rs. 740 Cr. and expected to be operational in March,2019. Mechanization of EQ 1, 2, 3 Berths at Paradip Port on BOT basis of 30 MTPA capacity at an estimated cost of Rs. 1438Cr. is expected to be operational in December-2020. 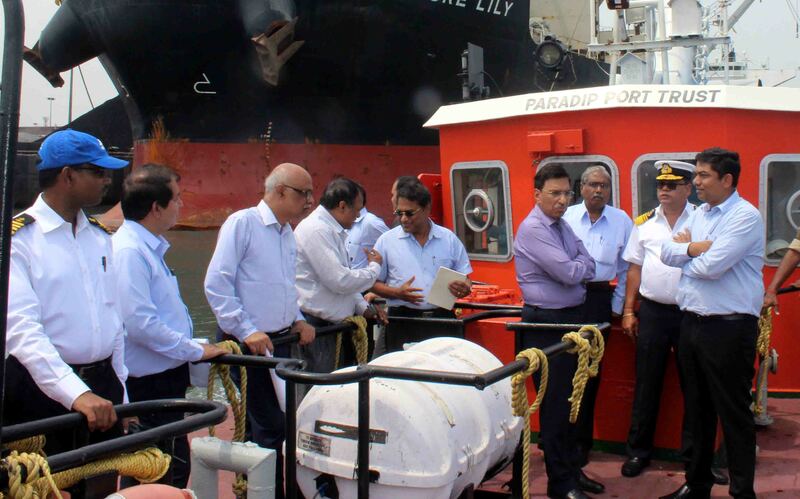 LPG Terminal at South Oil Jetty of 0.75 MTPA capacity at an estimated cost of Rs. 690 Cr. is also expected to be operational by December, 2019. Mechanization of CQ-1 & 2 (2 Berths) of 20 MTPA capacity at an estimated cost of Rs. 1103 Cr. to be initiated after commissioning of Development of New Coal Berth. Optimization of inner Harbor and construction of western dock of 30 MTPA capacity at an estimated cost of Rs. 2000 Cr. will be awarded in October 2018. As a part of capacity augmentation, under Sagarmala Programme of the Govt. of India an Outer Harbour is proposed to be developed at an estimated cost of Rs. 10000Cr. to handle large Cape-size vessels up to 2 lakh DWT up-to 22m draught and expected to be operational in 2021. In addition to the above, Port has taken up different initiatives to develop the Port city to a Smart Industrial Port City at an estimated cost of Rs. 2770Cr. In response to the clarion call of Hon’ble Prime Minister of India, Shri NarendraModi for “Swachh Bharat” to realize Gandhiji’s dream of clean India, Paradip Port organized the campaign with participation of all sections of the Port township so as to bring about mass awareness and behavioral changes to achieve the goal. Several activities like construction of toilets in schools and college in the Port township, construction, operation & maintenance of public toilets at different places in Port township and wide circulation of the message in print & electronic media etc. have been taken up. Cleaning operations are being conducted by PPT on a fortnight basis every first and third Saturdays of a month apart from Special Swachhata Drives like Swachhata Pakhwada, Swachhata Hi Seva Programmes to build the public awareness on swachhata. Dust Suppression System has been installed at siding plot -15 inside harbor area. 2 nos. of Mist Cannon have been procured and deployed for Dust Suppression System. Mechanical Road Sweeping machine is working on a day to day basis to keep the roads neat and clean in the Port Township. Port has installed two no.s of wheel washing system at Gate no- II & Gate no-III to avoid carryover of spilled material. Civil construction of two no.s of STPs of 2.5 MLD & 2 MLD to treat the sewage generated from Port Township is in progress. Construction of three no.s of settling ponds inside port prohibited area is also in progress. Apart from above PPT has implemented various environmental improvement schemes namely Plantations, Net barrier and Drainage. The Port has been discharging its commitment to the society by taking up several CSR activities. This fiscal an amount of 5.52 Cr. has been earmarked for the same. Paradip Port organised a six months free residential training programme for One Hundred Twenty (120) unemployed youth of Odisha through Central Institute of Plastic Engineering Technology (CIPET) Bhubaneswar at a cost of Rs. 72 lakh and all of them have been gainfully employed after the training.PPT is also supporting activities beneficial to the society by organizing free medical camps, literacy programmes through Paradip Sakhyarata Samity, running several educational institutions as well as Self-help groups, encouraging sports & culture etc. Paradip Port sponsored Asian Athletics Championship held at Kalinga Stadium with as sum of Rs. 25 lakh. Towards construction of Naugaon Bus stand, Rs. 50 lakh has been earmarked by PPT. Jagatsinghpur District HQRs Hospital has been sanctioned Rs. 10 lakh towards AC Installation and additionally Rs. 7.5 lakh has been sanctioned for purchase of beds. Rs.10 lakh has been sanctioned for ambulance to Kendrapara District HQRs. Hospital. Rs. 20 lakh has been sanctioned towards Kendrapara Town Hall development. In order to cater to needs of the denizens from peripheral areas of Paradip Port, free cataract operations have been conducted on 171 poor persons at PPT hospital in a year. An ALS Ambulance has been put to use for the common people of Paradip. On behalf of Paradip Port Trust, Chairman expresses his gratitude to Hon’ble Trustees, Port Users, Ministry of Shipping, Govt. of India, Govt. of Odisha, Indian Railways, particularly East Coast Railway, District Administration, Paradip Municipality, Trade Unions, all the employees and all other stakeholders who are connected directly or indirectly for their valuable contribution for all round development of the Port. Last but not the least, Chairman expresses his gratitude to the Print and Electronic Media for their continued & forth-coming support and encouragement being extended for smooth functioning and development of the Port and look forward for such continued support, guidance and co-operation by all concerned in the days to come. “Reinforce positive behaviour at the workplace to achieve safety and health goals” as the theme, the 47th National Safety Week was observed by Paradip Port Trust from 4th March to 10th March 2018. A function was held in the afternoon on 9th March 2018 in the Wet Basin. Attending the function, as the Chief Guest Shri Rinkesh Roy, Chairman, PPT focused upon importance of celebrating safety week. He suggested for ensuring the upcoming year as Zero Accident Year for PPT. He stressed on inculcating safety mindset especially among workers as PPT is vying for coveted mark of 100 MMT in terms of cargo handling. Most of the accidents are occurring in dark hours, PPT administration is going to install 50 Nos. of High Mast lighting towers in addition to the 218 Nos. of existing High Mast towers inside the Port prohibited area. Due to lots of train and truck movements in course of cargo transportation, to ensure safety of workers, Advance Warning System through light and siren will be installed within a month at the Railway Level Crossings inside the Port. Installation of Speed Governors and Traffic Squad movements are being made tight to keep close vigil on rash driving. PPT is endeavouring to ensure all movements inside port strictly through the Buses to be engaged by the Port to ensure safety of the workers. Shri Roy stressed on Discipline and Safe practices to make the Port – World Class. Thereafter, he awarded prizes to the winners of various competitions organised on the occasion. Gracing the occasion, Shri Gopinath, Asst. Director, Dock Safety, Paradip said to make Safety everyone’s responsibility. Shri Banshidhar Sundara, Sr. Commandant, CISF Unit, Paradip also addressed the gathering and said that we should make safety a way of life. Shri A. Jayasimha, CME, PPT in his welcome address called upon all the stakeholders to make the upcoming fiscal an Accident Free Year. Shri Chandan Panigrahi, Dy. CEE finally offered the vote of thanks. Republic Day was celebrated by Paradip Port Trust Authority with a great passion. Shri Rinkesh Roy, Chairman, PPT unfurled the National Flag and took salute from 38 platoons consisting of CISF Jawans, students of Paradip College, Orissa Maritime Academy and different schools of Paradip Township. Addressing on the occasion, Chairman, PPT informed that the Port is poised to reach 100 MMT mark in terms of cargo handling and thus by will join an “Exclusive Club” of Ports that have handled 100 MMTs namely Kandla and Mundra. It is also amongst the top three terminals in the country in terms of rakes handled per day. As envisioned by Shri Narendra Modi, Hon’ble Prime Minister of India and under the guidance of Shri Nitin Gadkari, Hon’ble Shipping Minister, under the ambitious Sagarmala Programme, the Port is augmenting its capacity. The Cargo Handling Capacity of it has been increased to 277 MMT per annum, which is the highest among all Major Ports. Four projects namely mechanisation of EQ-1, 2 & 3, construction of a new Deep Draught Iron Ore Berth, construction of new Clean Cargo Berth and Container Berth are in various stages of progress. The Clean Cargo Berth is slated for commissioning this year, which will boost not only the economy of Odisha, but also nearby states. A new Multi-modal Logistics Park spreading over 100 Acres of land will be set up, for which the work has been awarded to CONCOR and commencement of will happen this year. Paradip Port will emerge as one of the premier industrial hubs of the country and the Smart Industrial Port City will also fit into this vision. Under CSR activities, the Port is sponsoring 120 students each year for training through CIPET Bhubaneswar for gainful employment after training. Free cataract operations have been conducted on 163 BPL persons at PPT Hospital till date in the current fiscal and post operation treatment has also been extended to them free of cost. The Port is committed to treat 200 such persons in each fiscal. Under Janani Surakshya Yojana, incentives have been extended to 43 beneficiaries. He called upon everybody to avail the opportunity under the nationwide Measeles-Rebella(MR) vaccination campaign, for the children in the age group of 09 months to 15 years. Shri Roy unveiled “Paradip Port News” – the quarterly House Journal of PPT and “Deepa Jyoti”, the quarterly magazine of Paradip Sakshyarata Samity (PSS). Patriotic chorus by Lady members of PSS, Fire fighting demonstration by CISF Fire Wing, Martial Arts & Gymnastics by Orissa Maritime Academy Students were the major attractions on the occasion. Thereafter, Shri Roy awarded prizes to the students who have won in debate, essay, quiz, patriotic song competitions and also felicitated to the officers and employees of the Traffic, Medical, IOHP and MCHP Deptts. and Worshop Division of E&M Deptt. for their exemplary works. Thereafter, a Poet’s Meet was organised at Officer’s Club followed by an exhibition Women’s Volley Ball match in the afternoon at Gopabandhu Stadium and in the evening, the Inter School Patriotic Dance competitions were held among school children at Jaydev Sadan. Paradip Port Trust clocked all time monthly volume record in terms of Cargo Handling as it handled 10.18 MMT cargo in January, 2018 thus by achieving its highest ever monthly total. Addressing the gathering of the Port Users and stake holders along with other govt. officials, Shri Rinkesh Roy, Chairman, PPT described it to be a historic day for the Port. He credited the all-round efforts of the officials and employees of Traffic Deptt., Marine Deptt., MCHP Division and IOHP Division for this tremendous performance. The PPT Chairman expressed that, the way Port is increasing its cargo handling, it seems that, PPT will cross the coveted mark of 100 MMT cargo handling in the current fiscal. The previous record for total monthly cargo handling was reached only a month ago in December of 2017, when 9.5 MMT cargo was handled. The MCHP has handled the highest no. of rakes i.e. 570 in the month of January, 2018, whereas the IOHP handled 116 rakes. TheMarine Deptt. successfully conducted a record no. of 467 shipping movements during the same period. 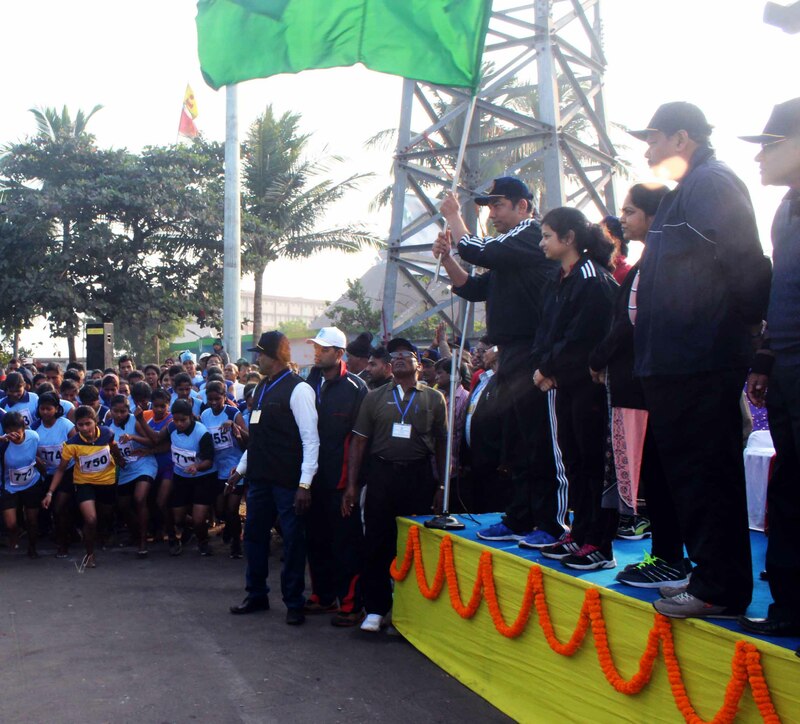 The 15th Paradip Marathon 2018 was conducted by the Sports Council of Paradip Port Trust on 3rd January 2018 on the occasion of Port Foundation Day. Shri Rinkesh Roy, IRTS, Chairman, Paradip Port Trust flagged off the same at the Hanuman Temple square. The Marathon covered a route of 14Kms and concluded at Gopabandhu Stadium amid great encouragement by the inhabitants of Port Township and members of other organizations. Mr.Mukund Banra of Jharkhand won the first prize in the men category by completing the distance in 44 minutes 24.7 seconds, Mr. Yogendra Tiriya of Jharkhand got the second prize (44 minutes 53.1 seconds) and Mr. Sudhansu Nayak of Angul got the third prize (45minutes 25.8 seconds) in the men category. In the women category, Ms Samsad Ara Begum of Cuttack won the first prize (52minutes 22.4 seconds), Ms Heera Majhi of Keonjhar got the second prize (58 minutes 11.7 seconds) and Ms Sobha Nayak of Jajpur got the third prize (58minutes 36.5 seconds). Attending as Chief Guest Shri Rinkesh Roy, Chairman, PPT, Smt. Subhalaxmi Roy, President Paradip Ladies Club attending as Guest of Honour, DIG Rajesh Makwana, Commander Coast Guard and Heads of the Deptt. of PPT gave away the cash prizes at the valedictory function held at Gopabandhu Stadium. The 41st All India Major Port Athletics Meet and 29th Children Athletics Meet jointly organised by Major Ports Sports Control Board and Paradip Port Sports Council concluded at Gopabandhu Stadium this evening. The host Paradip Port has emerged as Overall Champion whereas the Visakhapatnam Port bagged the Runners Up title. Ms. Nivedita Tarai of Paradip Port Trust emerged the highest medal winner with a total medal haul of 12 Nos. in the Under 18 Girls Category i.e. 4 each in Gold, Silver and Bronze. In the 4 days sports extravaganza, 214 men, women and children athletes from 7 Major Ports i.e. from Chennai Port Trust, Cochin Port Trust, Jawaharlal Nehru Port Trust, Mumbai Port Trust, New Mangalore Port Trust, Visakhapatnam Port Trust and the host Paradip Port Trust were vying for the top honours. Shri Rinkesh Roy, Chairman, PPT attended the valedictory function as Chief Guest and gave away the prizes. He appealed to the athletes to continue their sportsman spirit and bring more laurels at the national and international levels. Smt. Shubalaxmi Roy, President, Paradip Ladies Club attending as Guest of Honour on the occasion also distributed the prizes. Shri A. Jayasimha, CME, PPT and President of Gopabandhu Kreeda Sansad (GKS) presided over the function and gave the introductory remarks. Shri S.C. Nahak, SE, PPT and Working President of GKS and Shri Manas Kumar Sehti, Vice Chairman, Organising Committee also spoke on the occasion. Shri Rabi Das, Secretary, PPT Sports Council offered the vote of thanks. The Meet came to an end with a splendid Fire Crackers Show. Senior officials and employees from PPT and sports enthusiasts form the port township were present in large numbers. 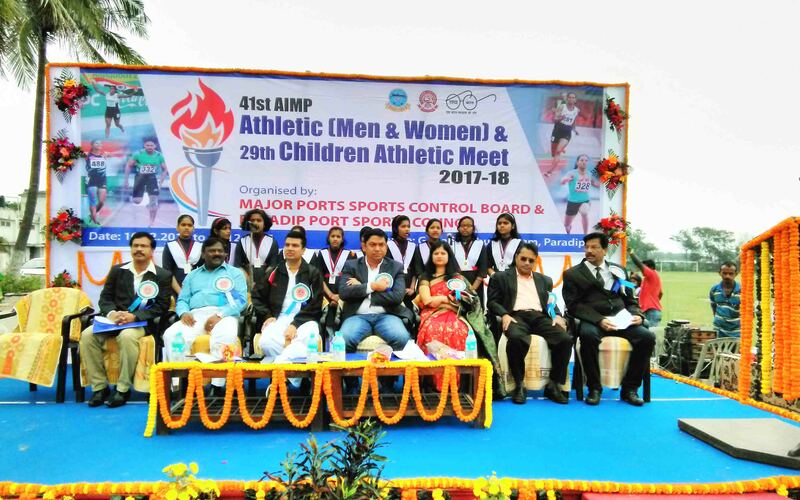 The 41st All India Major Port Athletics Meet and 29th Children Athletics Meet jointly organised by Major Ports Sports Control Board and Paradip Port Sports Council kick-started at Gopabandhu Stadium today morning. The inaugural function was attended by Shri Jai Narayan Pankaj, IPS, SP, Jagatsinghpur as Chief Guest and Shri Rinkesh Roy, Chairman, PPT, Shri N. Vaiyapuri, Dy. Chairman, PPT, Smt. Subhalaxmi Roy, President, Paradip Ladies Club were the Guests of Honour. A total of 214 men, women and children athletes form 7 major ports i.e. from Chennai Port Trust, Cochin Port Trust, Jawaharlal Nehru Port Trust, Mumbai Port Trust, New Mangalore Port Trust, Visakhapatnam Port Trust and the host Paradip Port Trust will be vying for the top honours. Inaugurating the event, Chief Guest Shri Pankaj, took salute in a march past by participating contingents from 7 Major Ports which was led by Ghosh Band Troup of Saraswati Shishu Vidya Mandir, Paradip. He told that it is important to participate in the Meet even if one does not get a medal. 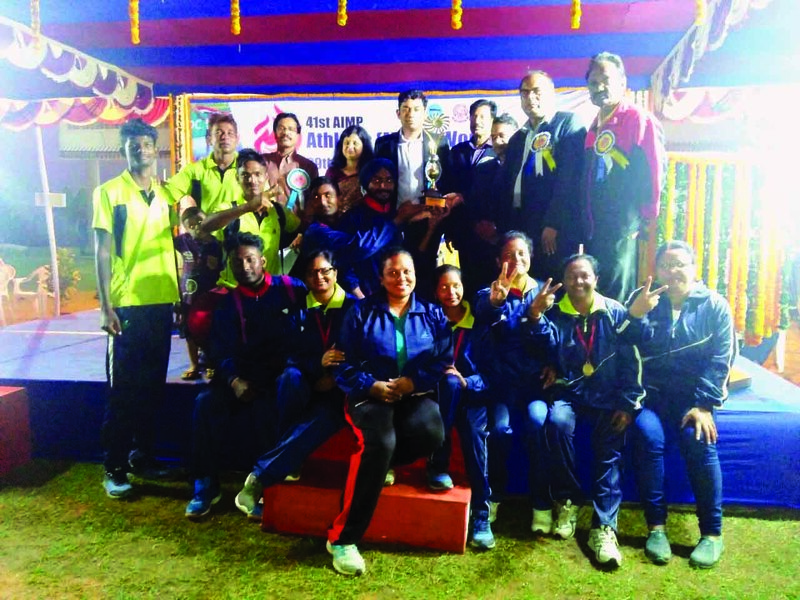 All are the winners, who take part in this meet in true sportsman spirit. Guest of Honour Shri Roy, Chairman, PPT said that inspite of adverse weather conditions here, the members of the Sports Council and officials of the Meet have taken all care to begin this meet to enable the participants in sportsman spirit as it is like a family meet of the Major Ports. He wished everybody a happy and fruitful stay at Paradip. Shri A. Jayasimha, CME, PPT and President of Gopabandhu Kreeda Sansad (GKS) gave the welcome speech and Shri S.C. Nahak, SE, PPT and Working President of GKS read out a brief report about the Athletics Meet. Shri Rabi Das, Secretary, PPT Sports Council conducted the inaugural programme in which Saraswati Shishu Vidya Mandir students sang the opening chorus and mesmerized the audience through their patriotic dance performances. Olympic Association Judges in association with technical officials from the locals schools of the port township will smoothly conduct the 4 days sports event which will come to an end on 13th December 2017.